Improved dispute prevention and dispute resolution are key concerns for both business and tax administrations by creating incentives for low-risk behaviour among taxpayers and helping tax administrations to better match resources to tax risks.Joint Audits are an essential element in the Tax Certainty Agenda and allow tax administrations to operate efficiently and effectively in an increasingly global environment, co-operating ever more closely and frequently with each other to ensure compliance, tackle base erosion and profit shifting, and minimise the probability of costly and time-consuming disputes.The report sets out the most advanced form of audit-related tax co-operation, provides best practices and identifies possible areas of improvement and future work, not limited to the OECD Forum on Tax Administration. 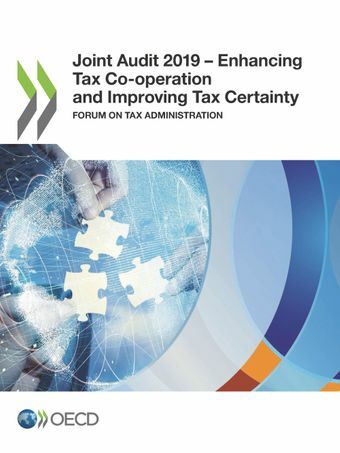 The report "Joint Audit 2019 – Enhancing Tax Co-operation and Improving Tax Certainty" identified a number of best practices to support international co-operation and in particular the conduct of Joint Audits. In this context the participants of the Joint Audit Project 2018/2019 developed a Joint Audit Implementation Package that includes relevant templates and model agreements that can facilitate and streamline any practical aspects of the conduct of a Joint Audit. The Joint Audit Implementation Package is being kept up to date on a regular basis.